It’s said to have come from the Yiddish word “rugel,” meaning royal. 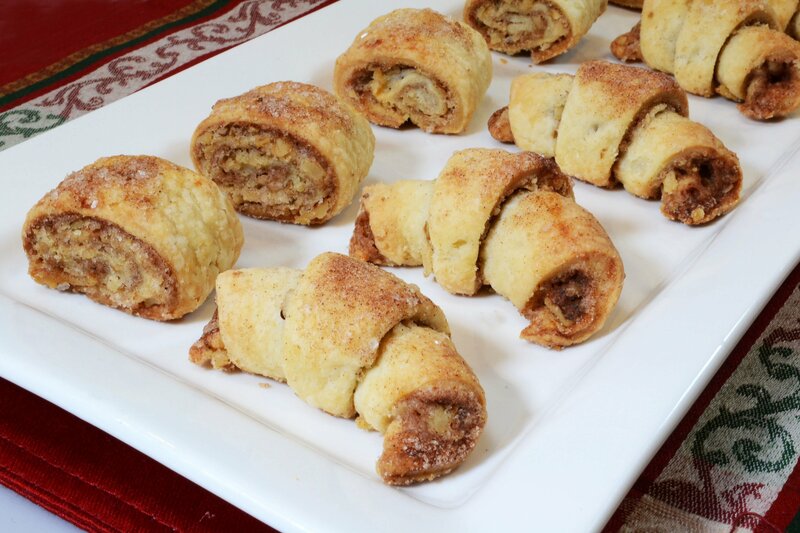 Rolled out, delicate dough filled with a variety of ingredients, Rugelach (pronounced Ru-ga-Lach) has grown in popularity from a Jewish specialty, baked during the holidays, to an American favorite, enjoyed all year long. It seems as though every country has its own version and name for Rugelach, and there are hundreds of recipe variations for this bite-sized goody. For the dough, sour cream or cream cheese is added to the flour which makes for flavorful dough that’s extremely easy to work with. These morsels are generally filled with ingredients like sugar, cinnamon, walnuts, raisins, chocolate, or preserves with a little cinnamon sugar sprinkled on top. Again, there are a number of ways to roll and cut Rugelach, but the classic shapes are crescents or slightly flattened squares. I know that Rugelach was baked up en masse for the Hanukkah celebration which ended last Thursday, but there are plenty of chances in the days ahead to make, bake, and deliver these delicious and delicate gifts from the kitchen for the holidays ahead! In a mixing bowl, blend together the butter and cream cheese until well incorporated. Add the flour, sugar, and salt, blending well. Gather dough and divide into two balls. Refrigerate in plastic wrap for at least 1-2 hours. Meanwhile, make the filling. In a bowl, mix together the sugar, cinnamon, salt, and chopped walnuts. When dough is chilled, cut each ball into two pieces. You will have 4 dough balls to work with. On a lightly floured surface, roll dough ball into an approximate 9" circle 1/16 of an inch thick. Sprinkle ¼ of filling mixture over circle, leaving a ¼ inch border. Gently pat filling into dough. Cut circle into 12 wedges. Roll each wedge up starting at the wide end to form a crescent. Sprinkle top with filling mixture. On a lightly floured surface, roll dough into a 9" long rectangle. Sprinkle ¼ of filling mixture over dough, leaving a ¼ inch border. Gently pat filling into dough. Starting at the bottom, roll dough up tightly into tube shape. Gently flatten tube with your hands. Cut into 1" squares. Sprinkle tops with filling mixture. Place pieces onto parchment lined (or lightly greased) baking sheet. Bake at 375ºF for about 15-18 minutes or until deep golden brown. Makes about 36 pieces. Dough can be made ahead and stored in plastic wrap for up to one week. Baked Rugelach can be frozen.